Summit Middle School students drop off donations to the Summit County Animal Control & Shelter. Class teacher Amie Harvey (top left) joined by students and teacher's aide Tasya Williamson, teacher aide Jeannine, Sheriff Jaime Fitzsimons, Shelter volunteer coordinator Mary Harmeyer and Undersheriff Joel Cochran. 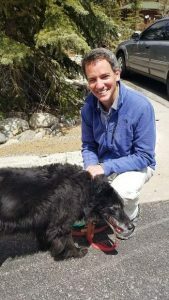 Summit students are doing their part to support their community while also giving joy to shelter animals. 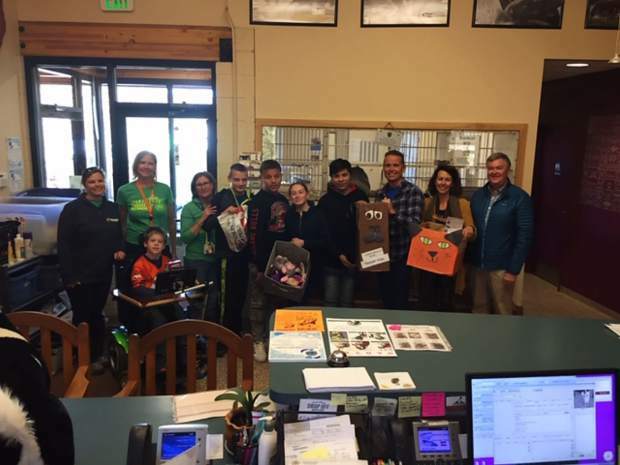 On Oct. 19, a Summit Middle School class taught by Ms. Amie Harvey visited the Summit Animal Control & Shelter to drop off donations they collected over a three-week period for a community service project. The donations included toys and treats for the shelter’s cats and dogs. Sheriff Jaime FitzSimons and Undersheriff Joel Cochran accepted the donations from the students on the shelter’s behalf. Third-graders at Summit Cove Elementary are also holding a donation drive for the shelter through mid-December. They are seeking donations of money, interactive toys, Kongs, training treats for dogs and canned food for cats. Donations can be dropped off at SCE’s front office or to the shelter directly.